Eco-friendly publisher, blOOturtle, is placing its support around Share the Dignity’s Christmas #itsintheBag collection that aims to make life better for women and girls experiencing homelessness or poverty ahead of the festive season. The publisher will donate $1 for every English version sold online of its latest picture book release, Willow Willpower, to #itsintheBag between 16th November and 2nd December 2018. Sydney 15 August, 2017 the team at eco-friendly book company, blOOturtle Publishing, is excited to announce the signing of established children’s book author, A H Benjamin. The Algerian born author is yet another fantastic addition to blOOturtle’s growing list of writers releasing titles through the trOOblOO eco-publishing program. “It’s very encouraging to see established authors like Benjamin who’s been writing books since the mid-eighties, choosing to transition into eco-friendly publishing,” said Nicola Ganaye, Creative Officer of blOOturtle Publishing. Sydney 19 July, 2017 — eco-friendly book company, blOOturtle Publishing, is excited to announce the signing of author, Sarah Cannata. The soon to be published Willow Willpower becomes the fourth publication to be released through the trOOblOO eco-publishing program. Ms Cannata is an Amazon.com international best-selling author and is yet another fantastic addition to blOOturtle’s growing list of authors. blOOturtle Publishing is dedicated to working with storytellers who are passionate, imaginative and encourage children to believe that with willpower and hard work, anything is possible. 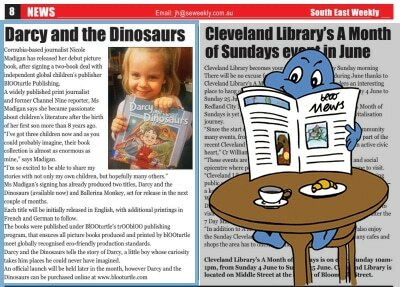 Author Nicole Madigan & Darcy and the Dinosaurs featured in South Brisbane news! Sydney 23 May, 2017 — the crew at eco-friendly children’s book company blOOturtle are excited to announce the signing of author Nicole Madigan.Nicole joins the blOOturtle catalogue as the first publication to be released through the trOOblOO eco-publishing program. Founded on the idea that there are many unique and interesting stories being told to children by their loved ones, blOO works with story tellers/authors who are passionate, imaginative and have “creatively confirmed” their ideas with the children in their lives. Ms Madigan’s signing has already produced two titles, Ballerina Monkey and Darcy and the Dinosaurs.Darcy’s tale of adventure is available now, with Ballerina Monkey set for release in the next few weeks. Each title will be initially released in English, with additional printings in French and German to follow. Sydney 26 April, 2017 — the crew at blOOturtle Publishing are pleased to announce the development of the trOOblOO, Thinking Kids publishing program that ensures all picture books produced and printed by blOOturtle meet globally recognised eco-friendly production standards. Sydney 5 April, 2017 — the crew at children’s book company blOOturtle Publishing are excited to announce the signing of a global distribution agreement with Australian author Michael Winn. blOO has added Michael to our catalogue as part of our commitment to assist authors share their works globally. Having already self-published his first children’s story Peter the Perfect Peacock, Michael has signed an agreement with blOO that will see his work join our catalogue for upcoming global book shows as well as become part of our global distribution program. blOOturtle publishing is a niche book company that produces and assists self-published authors of children’s books. In addition to producing our own publishing catalogue, blOO also assists you in “doing it yourself” with a variety of author support packages. Our criteria is simple, if there is a fantastic bedtime, nap time, kid time story to be shared, we want to know about it. So visit our website to learn more about our services and publishing programs.